In Sketchy Setups, I talk a lot about about fingerboard radius and why it’s important to set the height of your bridge saddles with that radius in mind. I've chatted about it here from time to time too. 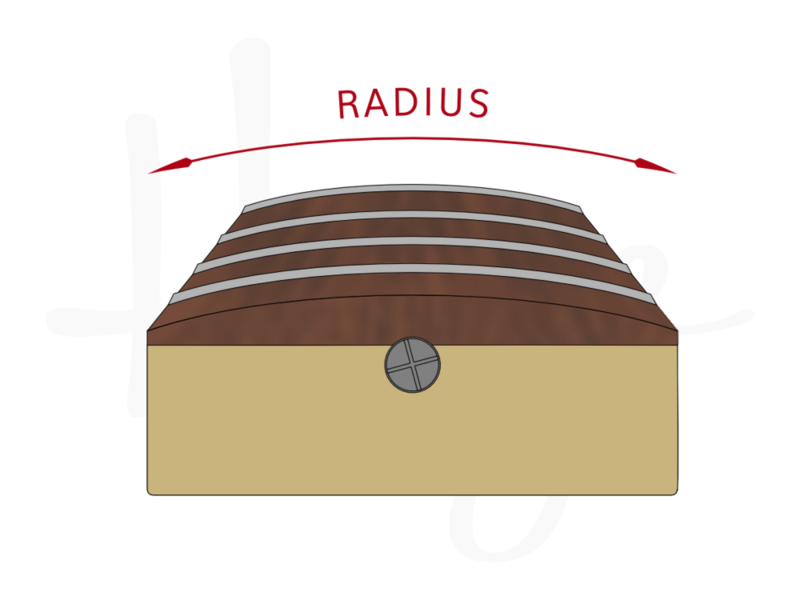 I worked on an instrument recently that illustrates this radius thing really well so I thought I’d revisit the topic and look at a slight curve-ball thrown by this particular guitar. In an ideal world, we want our string saddles set to follow this radius for a consistent feel and for good setup. A quick side note: Usually the action/height of your bottom strings will be higher than that of your higher strings. That’s ok. As long as you keep that fingerboard radius in mind, your action can graduate across the neck and still follow the radius. Click here or pop your details in the box below to get yourself some free downloadable radius gagues for easily checking your guitar or bass fingerboard and bridge radius. On your Strat or Tele style guitar, you can just set the height of individual saddles wherever you want them. Easy-peasy. A tun-o-matic adds a bit of a problem because the individual saddle height isn’t adjustable. Then we break out the nut files and carefully lower each string slot on the bridge so it’s where we want it to be. Annoyingly, tun-o-matic bridges often seem to have an incorrect radius so it’s worth checking yours if you have one. The wraparound/tailpiece bridge is a beautifully simple way to anchor strings. No muss, no fuss. Brilliant. I love them on Gibson’s Juniors. Generally, they match the 12” Gibson fingerboard radius pretty well and don’t need too much attention. Of course, if you fit it onto a Telecaster, things might not be so straightforward. This Tele has a 9.5” Fender-style fingerboard radius. The tailpiece bridge that’s fitted is closer to a 12” radius. This means that, when it arrived, the ‘outside’ strings had a very high action just so the inside strings could have a normal action. If the bridge radius doesn't match the fingerboard, you'll have problems achieving a consistent action. Check out the exaggerated drawing above. If the action of strings 1 and 6 was brought down, strings 3 and 4 were far too close to the frets and would buzz. So, the overall action was raised until those middle strings (3 and 4) played cleanly, leaving the other strings with an abnormally high action. This bridge had already been modified by cutting slots for each string. So I just modified it some more. I decided that lowering some of the string slots to better match the radius was the best way to go. Given that this particular bridge is steel, I hogged most of the material way with a Dremel tool. I mounted a couple of grinding wheels in the mandrel so I could manage the wider slots for the bass strings and did most of the work with those. I moved back to a single disc for the thinner strings. As the bridge was safely removed from the guitar for this work, I eyeballed things using a radius gauge as I went. I was prepared to pop it on and off the guitar a couple of times to finesse things at the end but, I got lucky and nailed it first time. Yay me! 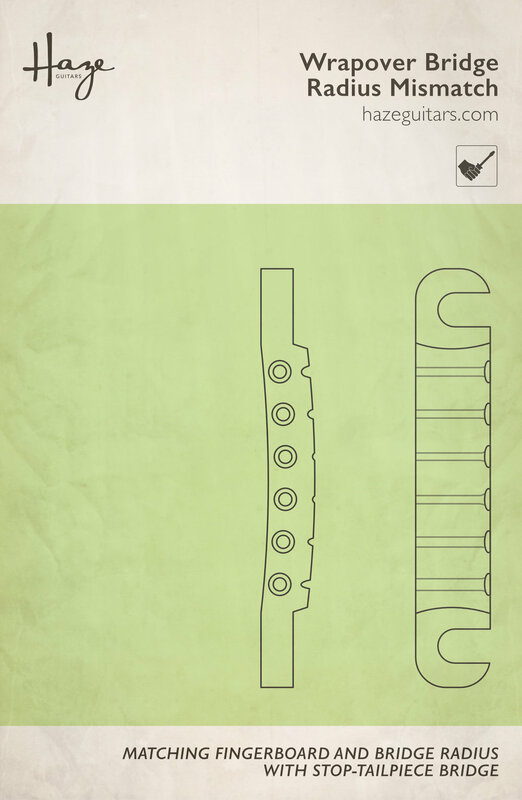 One possible solution: Modifying string slots in wrapper bridge to match fingerboard radius. I lowered the 1st and 6th strings by the largest amount. The 2nd and 5th strings a bit less, and the 3rd and 4th strings I barely touched other than to clean up the slots a bit. Once the Dremel work was complete, I cleaned the slots up a bit with some nut files and finished by polishing them up using some Mitchell’s Abrasive Cord, which is absolutely amazing for jobs like this. Stringing this guitar back up with the modified bridge allowed me to get a far better setup. The guitar has a much more comfortable action that’s consistent across the neck. String action more consistent when bridge matches fingerboard radius. Newer PostWho's to blame for tremolo?